Email contact@photospector.com with any questions, comments or feedback. The Feedback link in the About Photospector popover is an easy way to send mail directly from within Photospector. See the Press page for videos that provide an overview of Photospector’s features, including an Introduction, Live Histogram, Keywords & Smart Searches, Group Editing, Unlimited Resolution, and Gigapixel Zoom. For crashes on iPad 2 & mini when saving large images to the device gallery, open the Settings.app, select Photospector and change the Memory Cache size to 64 MB (default is 96 MB). No support for RAW photos in the current version. No support for Photo Stream in the current version. 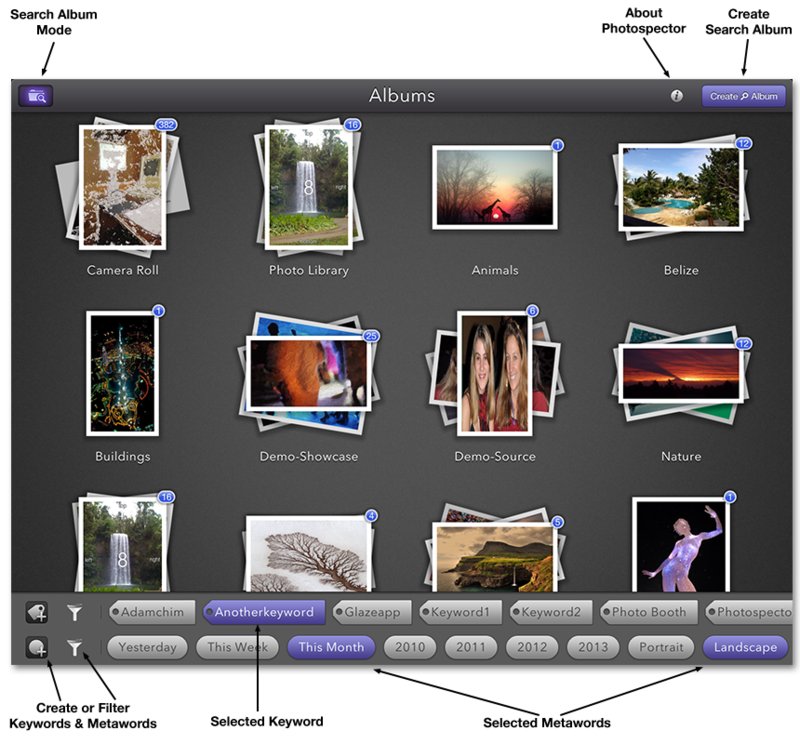 Photospector provides three main views: Album, Group and Image. The Album View shows all of your albums, allowing you to create and delete search albums that find images based on keywords or other metadata information. 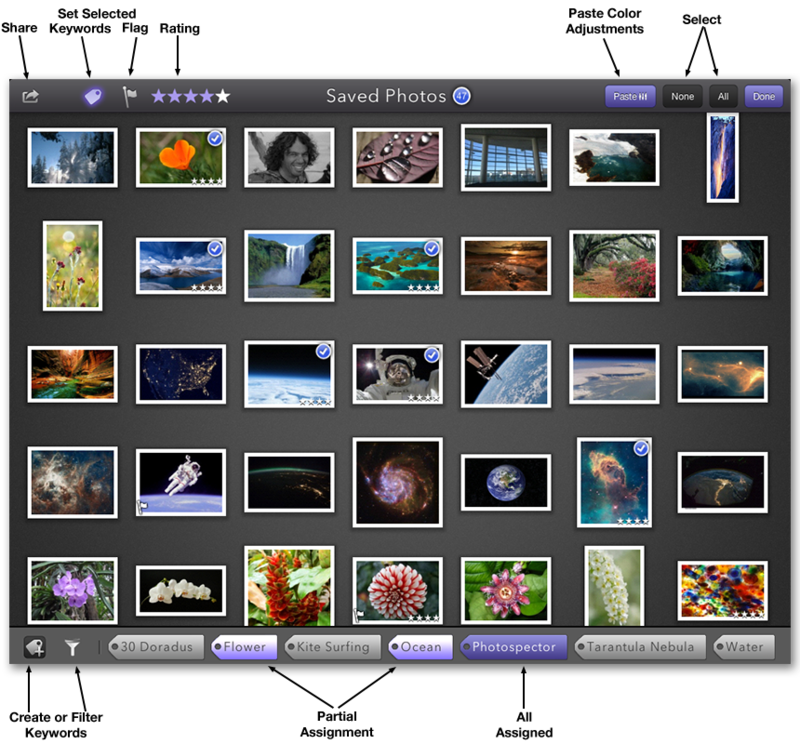 The Group View shows the images contained in an album as thumbnails, providing controls for editing groups of images together. 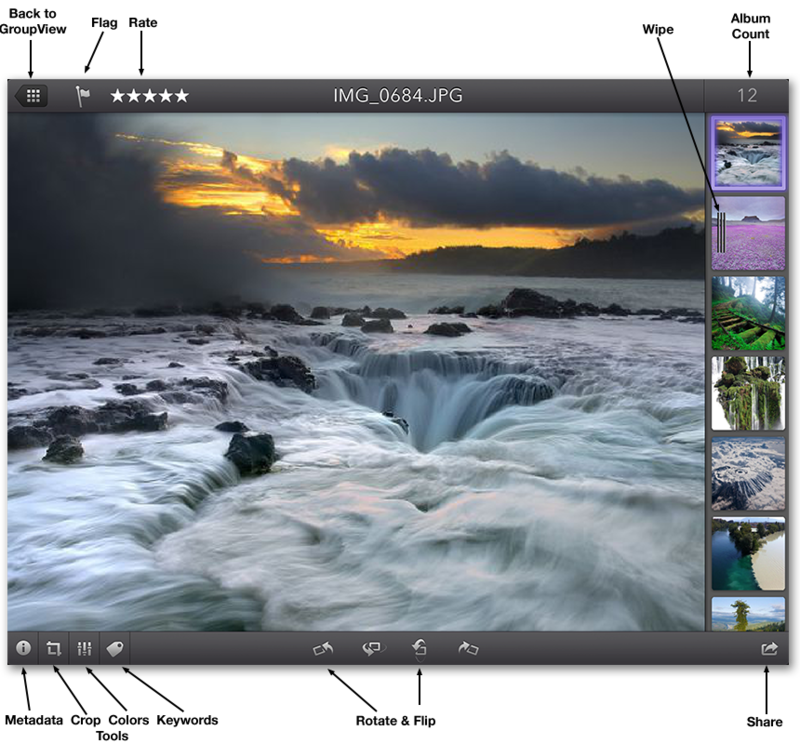 The Image View allows inspection, editing and comparison of individual images. All editing in Photospector is non-destructive. The original image file is never modified. All of the changes are stored as state within Photospector and none of the changes to the image — color correction, orientation, cropping, keywords — are visible to other programs until images are shared. Sharing the image, i.e. saving a new copy to the database or to any of the supported cloud services, will bake in the modified state so that it is visible to other image programs. Photospector saves the current state of all the images in a local cache so that all your changes are retained within Photospector, even if the program is exited or the device is shut down. Restarting Photospector will return to the exact same state as the last time you used the app. Edits will never reduce the quality of the image. The image is never compressed or modified in any way that would reduce the quality. The Album View shows all of your physical and smart search albums. All of the physical albums that exist on your device are displayed, with the Camera Roll and Photo Library (imported Events) first and the remaining albums sorted alphabetically. Tapping on any album selects that album and transitions to the Group View. Tapping the About Photospector button will bring up a dialog with links to this support page, as well as related information, including the current version number. Smart search albums allow you to quickly find sets of images from your physical folders. Smart searches never create new images or duplicate any data. They are just subsets of the data already stored on your device. Searches use the information stored in the image metadata, which includes dates, aspect ratios, flag status, star rating, and optional data about the camera, settings and geographic location. Smart searches are “live” and update instantly as you modify any of this data using the other tools in Photospector. For example, the Flag folder, which is the only smart search album created by default, is updated as you flag or un-flag images in the Group or Image views. The two horizontal bars at the bottom of the screen allow you to select words to use when searching for images. The top row are keywords, a special set of words that are stored in the metadata and used as hashtags when uploading images to cloud services such as Flickr. The bottom row are “metawords” which are either special “smart” searches like “Today”, “Landscape”, or the aspect ratios, or words to search for in the metadata. For example, the metadata often contains the camera manufacturer, so the metaword “Apple” will find all images that were taken on Apple devices, like an iPhone or iPad. You can create search folders that contain multiple tags. If multiple keywords are selected, the image will be matched if any of the selected keywords are in the image. Multiple metawords are a bit more complicated. The metawords are broken into separate categories for dates, aspect ratios, ratings and expressions. If you select multiple dates, like “Today” and “2010” the image will match if it is either taken Today OR at any time in 2010. Similarly, if you choose 4:3 and 3:4, then you will find any image that is either 4:3 OR 3:4 aspect ratio. But if you select 2010 and 4:3, then the search album will only contain images that are 4:3 AND taken during 2010. The tag filters, when selected, show only the selected tags, which can be helpful when you have lots of tags. You can create new keywords or metawords using the buttons on the left side of each bar. Creating a keyword in the Album View does NOT assign it to any images. It just creates the term so it can be assigned later or used to create a search album. Creating a metaword expression will create a search term that is matched against all of the metadata in the image. This is a slow operation as Photospector does not keep all the image metadata in memory for all images. Instead, it must search through all the images, loading the metadata and checking for a match. However, once a term has been searched, the results are cached so that subsequent uses of that term are instantaneous. The Group View shows all of the images in an album showing the star rating and flags on top of the color corrected and oriented thumbnails. Tapping on any image will select that image and navigate to the Image View. Tapping on the Album button in the upper left (not shown below) will navigate back to the Album View. Selecting the Edit button at the top right will enter the group editing view below if you have already purchased the Group Editing features. Otherwise, it will take you to the store to purchase Group Editing for $1.99. Group editing allows you to assign keywords, flags and star ratings to groups of images using multiple selection, or to share groups of images and perform batch processing. When you have entered the Group Edit mode, the controls in the top navigation bar change to the ones shown below. Tapping on images will add or remove that image from the currently selected set, as indicated by the blue check marks. The None and All buttons will clear the selected set or select all of the images in the current album respectively. The Paste button, which will only be enabled if you have previously copied color settings in the Image View, will apply the saved color adjustments to all of the images in the selected set. The Flag and Star Rating tools will set the flag or rating for each of the images in the selected set. Icons for the current flag and rating values are displayed on the bottom of each thumbnail. Tapping the Keyword tag in the navigation bar will open the horizontally scrolling tag bar shown at the bottom of the screen. Tapping the Keyword button again will hide the tag bar. The color of the keywords in the tag bar indicates the state of that tag for all of the selected images. A dark blue color indicates that the tag is assigned to ALL of the images in the selected set. A light blue color indicates that SOME of the images in the selected set contain that tag. A gray tag indicates that NONE of the images in the selected set contain that tag. Tapping the Create Keyword tag at the lower left will create a new tag and assign it to all of the images in the selected set. Tags cannot be duplicated. As a result, you can always type in tags to assign them to images. If you try to create an existing tag, it will simply be assigned to all the images in the selected set (it will not create a duplicate tag). We hope to add predictive text entry in a future version of Photospector to improve the Create Keyword interface. The Keyword Filter will restrict the set of displayed tags to those that are assigned to at least one image in the selected set. This is a very handy way to explore the tags in a set of images. The filter button will retain its state as you move in and out of the Image View. Leaving the filter enabled is a great way to easily see which set of tags are assigned to images. Combining the Keyword Filter and the Create Keyword tools is a great way to work when you have a large number of tags. The Image View provides a set of tools for inspecting and editing images. The thumbnail sidebar contains the other images in the current album and tapping on any image will switch to that image. Additional tools are provided to view and edit the image metadata, cropping, or color adjustments. Tapping on the Group View button in the upper left will navigate back to the Group View. The currently selected image is outlined with a purple rectangle in the thumbnail sidebar. The first time an image is shown it must be cached for display, but once cached, you can use the sidebar to toggle between images for comparison. Small images are cached quickly, but larger images, especially those larger than 100 megapixels (larger than any image from any camera), may take several minutes to cache, but typical images will be cached in just a few seconds. Tapping on the image will hide the interface, except for the currently active tool. Double tapping will zoom in and out of the image. Tapping any of the tool buttons or the share button will activate the heads-up-display (HUD) for that tool. You can freely switch between tools at any time and your state will saved. You can make edits in one tool, switch to another, make more edits and then switch back at any time and all of your edits are retained. However, any of the changes you make are only visible within Photospector until the image is shared (saved) to the Gallery or to a cloud service using the Share tool. Edits are always non-destructive, so you can return to the original image state at any time without worrying if you are losing image quality. Tapping the flag or star rating button will set or clear the flag and rating values for the current image. Tapping on the rotate left and rotate right buttons, the outer two orientation buttons, will rotate the image to the left or right. The flip and flop buttons flip the image vertically and horizontally. The crop tool allows you to select a sub-rectangle within the original image. Drag the corner or edge handles to change the region. Use pinch & zoom to move the image underneath the crop tool. The buttons along the bottom toolbar along the bottom toolbar allow you to select an aspect ratio for the crop region. Free mode will allow any aspect ratio, but the other buttons restrict the aspect ratio of the crop region as you drag the handles. The Source button, on the far right, fixes the aspect ratio to the same as the original image. The color level tool adjusts the colors within the image using a set of standard image processing operations. You can set the input and output white and black points and adjust the gamma curve. Sliders are provided to adjust the brightness, exposure, contrast, luminance, saturation, vibrance, and color balance. The eyedropper tools allow you to separate the white and black points into colored values. Press down on the eyedropper and drag it over the image to select a color. Select the whitest part of the image for the white point and the blackest part of the image for the black point. You will see the red, green, and blue lines of the color curve diverge to indicate the selected value. The gray eyedropper computes a gamma curve such that the selected color passes through the mid gray value. The keyword tool views and edits the image keywords. When the keyword tool is selected, a tag bar is shown along the bottom of the screen containing all the keywords in all the images on your device, plus any additional keywords you have added manually. Keywords assigned to the current image are highlighted in blue. Pressing the filter button will only show keywords that are assigned to the current image, which is very handy if you have lots of tags, or if you just want to see which tags are on each image. Pressing the add keyword button will create a new tag and assign it to the current image. If the tag already exists, it will simply be assigned to the current image (no duplicate tags are allowed). We hope to add predictive text to the add keyword tool in an upcoming version of Photospector. A number of less common controls are accessible within the iOS Settings tool. Select the Photospector entry from the list on the left side in the Settings tool to access these controls. Settings are retained even if you upgrade the application. Once set, they are used within Photospector to control various options that cannot be set from within the app. At the top of the Settings page is the current version of Photospector. This same value is also visible in the About Photospector popover. Please include the version number when reporting issues. The version number is the only non-editable field in the Photospector settings. Photospector maintains a local cache of files. Each file in the local cache is organized to allow for interactive viewing no matter how big it is, even up to multiple gigapixels. The size of the disk cache controls how many images can be stored. Storing multiple images in the cache allows you to toggle between those images without any delay. Increasing the disk cache size allows you to store more images and makes it easier to compare images in the Image View. The Cache Memory Space is used to create the local cache files and store images to improve performance when switching between multiple images. The memory cache is faster than the disk cache, but much smaller. Increasing the size of the memory cache is important when you want to view very large (gigapixel) images, but the default size should be fine for almost all normal photo editing. The metadata fields for the Copyright and Author are used when saving out images. When set, these values are stamped into each image as an invisible watermark, and carried along with the image file.